Provides the emotional energy and clarity to approach and manage life with optimism and resilience. A Healthy Mind contributes to the prevention or better management of mental illness. Eat nutritiously with a focus on natural, unprocessed foods and a balanced intake of nutrients; following the recommended guidelines for health benefits. Recognize the benefits and enjoyment of physical exercise/movement, and invest time in individual and group activities that build endurance, flexibility, and strength; follow the recommended guidelines for physical activity. Get sufficient amounts of rest, both during the day as well as sleep at night, to support the highest achievable quality of work and life. Limit, eliminate or be better informed about the use of substances - such as tobacco, alcohol, drugs, and others - on health and well-being. 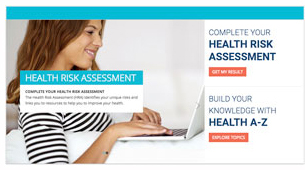 Sun Life offers a Health Risk Assessment quiz through their website. This quiz compares important lifestyle traits like your eating, sleeping and exercise routines with health guidelines to pinpoint what you’re doing well and where you could use a little motivation to make sure you’re in top shape for years to come. It will take about 15 minutes. To access the quiz, log into your Sun Life account, under your benefits tab, select Wellness Centre.